Top a cheesy meatloaf with bacon for a tasty Cheesy Bacon Meatloaf dish! 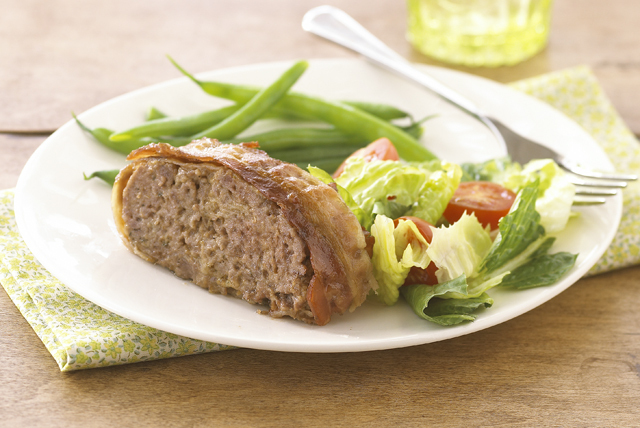 With just 10 minutes of prep time, our Cheesy Bacon Meatloaf sure is easy to make. Shape into loaf in 9x5-inch loaf pan; top with bacon. Bake 45 min. or until done (160ºF). Let stand 5 min. before removing from pan and slicing to serve. Serve this cheesy entree with a mixed green salad and hot steamed vegetable, such as green beans. Cook meatloaf until instant-read thermometer inserted into center of loaf registers 160°F, or when center of loaf is no longer pink. For an attractive presentation, arrange bacon slices in criss-cross pattern on top of meatloaf before baking.